A professional, low-emission KombiMotor with 30% more power and better air filtration than the previous model. Tackle yard projects with ease with the KM 111 R KombiMotor. 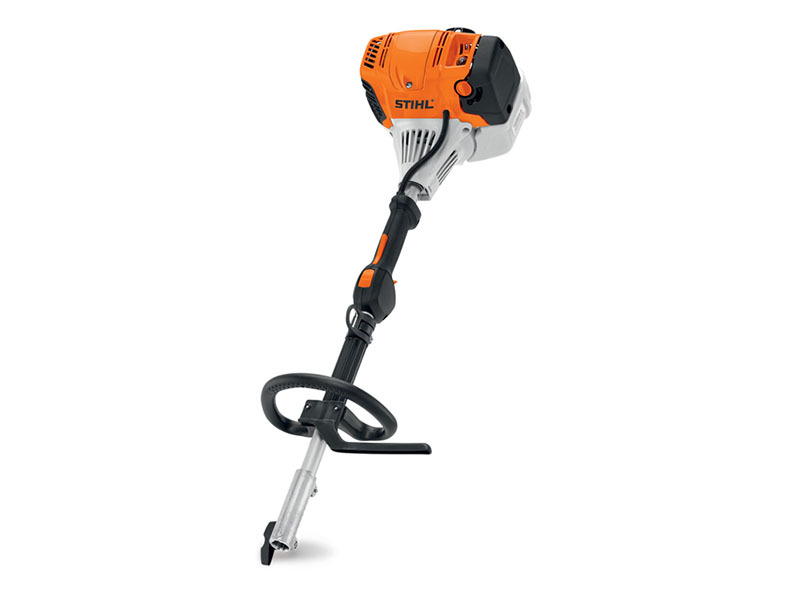 Part of the STIHL KombiSystem of multi-tasking tools, this model features a powerful, low-emission engine with a large fuel tank that provides 30% longer run times than the previous model. Professional landscapers looking for power and versatility will like the KM 111 R and its semi-automatic choke lever, one-touch stop, and improved air filter extending service life and replacement intervals. Plus, the KM 111 R is compatible with up to 14 interchangeable attachments, allowing you to operate and power up multiple tools with one KombiMotor while saving on fuel and maintenance. NOTE: STIHL KombiMotors and STIHL KombiSystem attachments are sold separately. 14 OPTIONAL ATTACHMENTS AVAILABLE: Create a custom yard care system with up to 14 optional attachments – trim, edge, cultivate, prune, clean up and more! LOOP HANDLE: The loop handle (R) is an adjustable rounded handle mounted on the shaft for support and control. The handle is designed to help control the machine in different positions, ideal for reaching tough spots. The handle is large enough to accommodate a gloved hand comfortably. QUICK-RELEASE COUPLING: The quick-release coupling system makes it easy to switch between Kombi attachments. In addition, this feature allows KombiSystem equipment to be dismantled into two parts for easy transport and storage and then re-assembled quickly without tools. SPLIT SHAFT: A split shaft and special toolless quick-release coupling lets you easily switch between attachments, making the KombiSystem highly versatile as well as easy to transport and store. ELECTRONIC IGNITION MODULE: The electronic ignition provides reliable starting and because it is fully enclosed, it is protected from moisture and debris for longer service life. PURGE PUMP PRIMER: A small fuel pump delivers fuel to the carburetor when pushed, reducing the number of starting strokes required following extended breaks in operation.